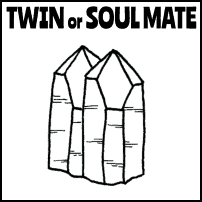 The crystal names Soulmate and Twin Soul can be used interchangeably. They are two crystals of a similar size grown side-by-side. On some Twin or Soulmate crystals, the faces of the crystals are exactly parallel to each other. This means they are on the same growth plane. Sometimes the two points are simply side by side, and not aligned on the same growth plane. 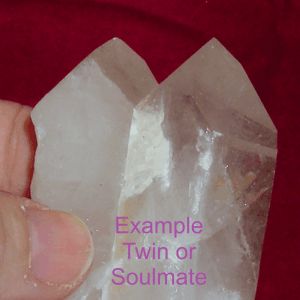 Soulmate or Twin Soul crystals are able to assist us in our search for a mate; just don’t expect to be able to put one by your chair at night and expect it to zap Prince or Princess Charming to your side by morning. This crystal can definitely assist you in attaining an appropriate energy for attracting a mate. They are also helpful in relationships, to promote loving contact and togetherness. Packaged with a business-card-sized printed description. Crystal sizes vary, depending on the configuration and are hand-selected for you at the time of your order. Image = example of TYPE crystal described. Do you have any ‘cross’ crystals available? They grow in that shape across each other. I wondered to know more about the property of this kinda crystal and what its called? 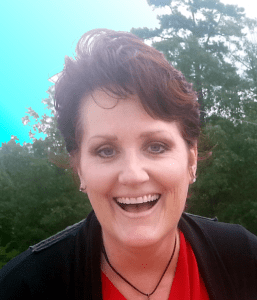 Need help selecting a crystal? Email me and I will help. Thanks for Visiting!